Beautiful and well-maintained 4 bedroom, 3 bath, 3 car garage home nestled on spacious corner lot with large yard. Distinctive foyer opens to the large formal living/dining room combo and features a lanai entrance. Kitchen is light and bright with granite counters, lots of cabinet space, and a large breakfast nook with picture window. Kitchen overlooks your spacious family room with sliders to the lanai and lots of space for entertaining. Master suite features spacious closet, lanai entrance, and a master bathroom with garden tub, his and her sinks, and lots of natural light. 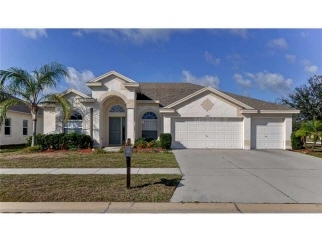 Located in the beautiful golf course community of Summerfield. Less than 5 minutes to shopping, new hospital, and I-75! Available for immediate occupancy. Pets ok with owner approval.